Welcome to the Far West Masters! If you are a new visitor to our site, you may wish to visit the Information pages to learn more About masters racing. See the How To Join page for membership information and applications. We are open to all and welcome new racers! Masters ski racing is the premier adult ski racing series in the country. We are governed by United States Ski & Snowboard competition rules, the sanctioning body in the US for organized ski racing at all levels from juniors up through international and Olympic competition. Far West Masters organizes US alpine masters competition in the Far West division. Our yearly schedule includes all disciplines (SL, GS, SG, and DH), with races held mainly at ski areas in the central Sierras. Racers from 21 to over 80 years old compete in ten-year age groups. As any of us who have had the pleasure to share a race hill or ski slope with him have learned, Gate de Mattei is a pretty special guy. He's a committed ski racer, always looking to improve and go fast, and just as committed to getting out on powder days and freesking, leaving companions decades younger in his wake as they try to keep up! And though retired from his medical practice, his trusty black bag and expertise have been a welcome aid many times over the years when accidents or injury strike and knowledgable advice is needed. Now our admiration of Gate's continuing excellence is official: the 2019 Al Sise Outstanding Masters awards have been announced and the winners are: Jeannette Saylor (W08, Rocky) and... Gaetano de Mattei (M13, Far West)!! Congratulations to both Jeannette and Gate, who demonstrated that excellent racing is accomplished across the entire age spectrum of masters competition. 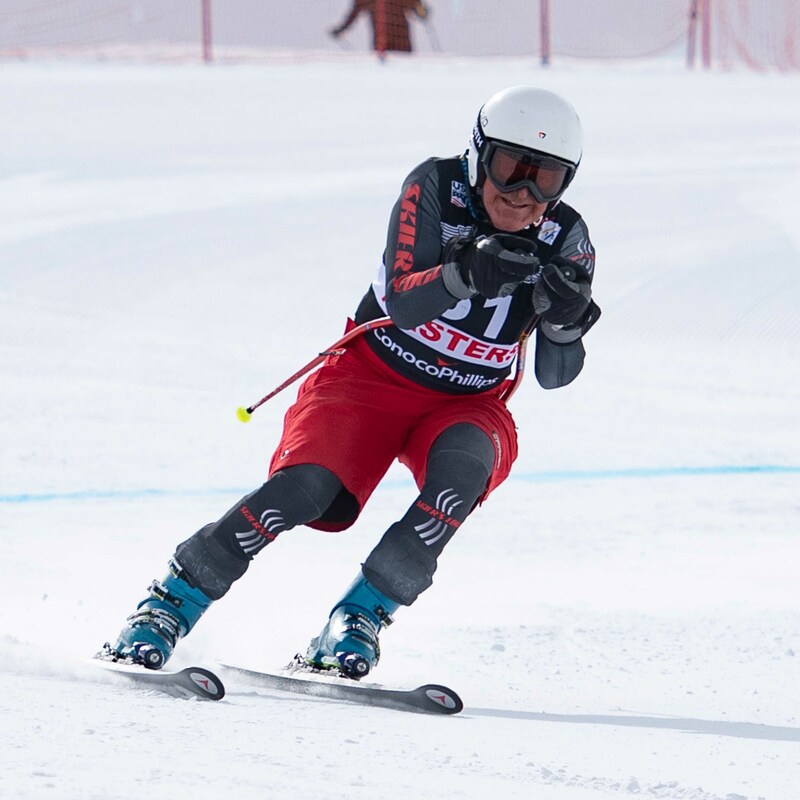 Gate continues to impress and inspire all of us, and after celebrating his 90th birthday in February at the Aspen FIS Masters event he is already looking forward to next season when he moves up to M14 class. A masters legend has left us. Just one week before the annual masters national championships in March that brought together many who knew and raced with him, John Gianotti passed quietly at the age of 90. John's ski racing career took off in the late 1940's as captain of the UNR ski team, and continued until health and hip problems in his 80's finally closed his racing career, though even then he remained active and continued to ski and golf regularly. John was a great ski racer and champion, winning US and FIS international masters competitions, and was named US masters racer of the year 3 times, a great recognition of his racing accomplishments. Perhaps even more than his racing, John was known as a great character about whom stories abound among all who knew him. At this season's Viva Italia races at Heavenly, a perpetual FW trophy that John started as a unique tribute to whoever he felt deserving of recognition, the post-race gathering of competitors became a sunny afternoon session of sharing John G. stories. And at the March national championships, with many of his racing friends from around the country gathered, Rees Palermo gave a tribute to John's memory by sharing stories of their racing adventures, closing with a rousing "Viva Italia!!" cheer from all. John's spirit will remain a part of Heavenly and the mountains he loved, and his joy in life will continue to inspire all of us who share his love of ski racing. How did it go today? "It was a great run!" The 2018-2019 Far West Masters race season is completed, but with copious snowfall during February and March, there'll be plenty of spring skiing and opportunity for spring training camps. Mammoth Masters head coach Pierre Jeangirard will be running weekend SL and GS training sessions at Mammoth through Memorial Day at the end of May. Cost is $100/day; contact Pierre directly at katopj@aol.com if interested. The final races of the 2019 Far West Masters season were held at Alpine Meadows on Fri-Sat Apr. 5-6. The winter of 2019 continued its stormy pattern of February and March by bringing us a small spring storm for our season finale. While it wasn't the sunny spring conditions we had hoped for, all were grateful that the warm storm delivered snow rather than rain! With snow and fog on the upper mountain ahead of the afternoon storm front, Friday's GS was held on Yellow trail. Although a relatively short course, the improved visibility that held just long enough to complete both runs was well worth the venue adjustment. Friday's SL double-header on Kangaroo was delayed by a rare wind hold even on the lower mountain lifts at the base of Alpine. Thankfully, lifts were able to open at 9am, resulting in only a short delay for the start of the first race. With courses set for the second race but warming temperatures and rapidly softening snow conditions, the race jury announced a hold on the schedule for the second race to assess course conditions. Reluctantly, the jury decided to cancel the second race in the interests of competitor safety and that was a wrap for 2019 racing for Far West masters. The season finale banquet and awards were held on Saturday evening at The Lodge at Tahoe Donner. In addition to race and season awards, an inspiring group of Far West Masters Scholarship athletes were on hand and some great items were offered at the fundraising silent auction. Following the presentation of season age class awards and the 2020 leader bibs to the top-5 women and top-10 men in the overall season results, FWM president Ray Tulloch presented our special awards. The New Racer awards went to Cherie Williams (W02) and Wolfgang Virostek (M01). The most-improved men's category had so many worthy candidates that ultimately a tie was declared to recognize the season-long battle between Kirk Swanson and David Piermarini in M07, which went down to the final race of the season to settle. The Cantanho Spirit of Masters award was presented to Shawn Mason, while a new discretionary President's Award was presented with a standing ovation to recognize the gritty comeback to racing after a devastating 2017 ski accident of M11 star Don Merritt. Congratulations to everyone who competed this season! Complete race results are posted on the farwestmasters.org Race Results page along with the final Season Standings rankings for 2019 and the Season Awards report. The 2019 US Masters National Championships were held at Mammoth Mountain CA the week of Mar. 17-23. After a stormy mid-winter that produced record-breaking February snowfall totals at Mammoth and Tahoe ski resorts, a welcome shift to sunny weather finally arrived the week before the start of the event. With the Mammoth Race Department (MRD) crews busy setting fences on the race venues, early-arriving competitors were invited to join weekend training with the Mammoth masters coaches for section training on the DH and SG tracks. The gorgeous weather and excellent conditions on the speed track held into Monday for the opening day of DH training, with two training runs completed on a fast and challenging set on the Cornice Bowl/World Cup/Fascination course. With weather forecasts calling for a moderate storm moving in on the scheduled Wednesday DH race day, the jury and MRD made the call to move the DH race up to Tuesday morning. While all regretted losing the additional day of training, the schedule change turned out to be exactly the right call - conditions and visibility were good on Tuesday morning and a very successful DH race was enjoyed by competitors, wrapping up just ahead of the arrival of storm clouds at mid-day. Wednesday proved to be as stormy as predicted, with wind, snow, and low clouds hampering visibility and closing the upper mountain. Although the storm was forecast to clear and move out on Thursday for SG race day, mountain operations were limited for much of the day by avalanche control work and no racing was possible. Once again the jury and MRD met and came up with a creative reschedule plan to postpone the SG rather than cancelling, with each group running SG on their GS day. Friday's weather cleared and allowed C/D groups to race SL on Fascination and the younger A/B men to run both their SG and GS races on the World Cup/Terries course. With both races using the same start and finish, all agreed that such a long GS was more than sufficiently challenging! The final day of competition on Saturday brought another small storm that proved to be far more problematic than expected for racing conditions, with wind, snow, and limited visibility above mid-mountain all day. The C/D SG race was cancelled after jury and crew went up to the course and reported that conditions were not safe for racing on the speed track. The A/B men raced SL on Fascination amid continuing snow that resulted in challenging conditions all morning. The C/D groups went up to their course late morning, with a shortened GS track on Terries holding the best hope for getting the race off. Alas, despite mass slips by all competitors, there was simply too much new snow to safely clear the track for racing, with continued fog and wind bringing more snow, and ultimately the jury decision was to cancel the C/D GS. The week wrapped up with the Saturday evening banquet, with race and combined awards. The Division Cup was taken home by the Eastern team and the 2020 Spyder national masters team named. Complete results are published on usalpinemasters.org/2019/nationals. Many thanks for the efforts of the outstanding Mammoth Race Department and the support of Mammoth Mountain for putting on our national championships, despite variable weather conditions that challenged organizers and racers through the second half of the week. We also greatly appreciate the support of Bob Davis and sponsor Phillips 66, who provide essential assistance to putting on a quality championship event. Just a reminder to sign up for the season banquet on Saturday evening if you plan to attend! We need to get a solid head count early in the week so we can confirm plans with the Lodge. Register for your tickets on SkiRaceReg.com/fw along with your race entries. Online finals auction bidding: Eddie Mozen has posted some of the "big" items that are being offered at the season finals auction online on the Far West Skiing site at https://fwskiing.org. Check it out to prepare your bidding plan, or to put in a bid if you are unable to attend the banquet. Volunteers needed! Alpine is looking for additional volunteers to help with our races, so if you have family or friends who might be interested please contact Alpine at alpinevolunteers@squawalpine.com. Volunteers will receive a lift ticket for the day and a voucher, good thru next season for use at Alpine or Squaw. REMINDER:The early registration deadline is Sunday Mar. 31, with $5/race late entry fee for entries submitted after the deadline, so get your entries in before the price goes up! Online registration for the Alpine season finals races and banqet closes Wednesday Apr. 3 at 8pm. Our final Far West Masters races of the 2018-2019 season will be held on Fri-Sat Apr. 5-6 at Alpine Meadows, with a GS race on Friday and two SL races on Saturday. On Saturday evening, we will have our season banquet at the Lodge at Tahoe Dinner. The banquet will include a silent auction fundraiser for the Far West Masters Scholarship Program. The auction is a major contributor of funds to support our junior athlete scholarship program, which has been supporting Far West Junior ski racers for 30 years and is an entirely volunteer-run program - all funds go directly to athletes. The early registration deadline is Sunday Mar. 31, with $5/race late entry fee for entries submitted after the deadline, so get your entries in before the price goes up! Online registration for the Alpine season finals races and banqet closes Wednesday Apr. 3 at 8pm. A short meeting of the Far West Masters board will be held on Saturday immediately prior to the banquet to report to the membership, hold elections for officers, and solicit comments and suggestions from members. Calling all auction donations!! Eddie Mozen is soliciting items for donation to the auction - all items accepted! Contributions can be hard goods, services, restaurant and store credit or any other creative item for auction you might think of. If you would like to contribute, please contact Eddie Mozen at ebmozen@gmail.com. We would like to have contributions made by March 30th so we can get those items to our on line auction site prior to the auction on April 6th. The Far West Masters Scholarship Program is an incorporated 501c(3) public charity tax exempt organization. The March issue of the Forerunner newsletter is out! Click the link below to read online or download your copy. The Fall newsletter as well as previous issues of the Forerunner from past seasons are always available on the Newsletters page. Electronic copies of the Forerunner are sent out on the news email list to all recent members of Far West Masters. If you purchased a print subscription to the newsletter this season, you will also receive a copy in the mail. The March issue has stories from the first half of the 2018-2019 race season along with scholarship program news and the President's Letter column from FWM president Ray Tulloch. The snow gods are winning again this week... After Tahoe received a massive poundling last week, more snow is still falling and expected to continue into at least Thursday. Rose masters coach/FW president Ray Tulloch inspected the race hill this morning with other Rose race crew and reports a foot or more already and still dumping. Given the large quantities of new snow, the unanimous consensus is that it will not be possible to prepare the venue for racing by this weekend. There simply isn't enough time to get the hill packed, reset fences, and all the other work needed to get the hill into raceable condition. Our next races are the National Championships at Mammoth the third week of March on Mar. 18-23. Registration is still open on SkiRaceReg.com so it's not too late to enter and the weather forecasts are finally starting to show a transition to high pressure and clear weather! The "Febru-Buried" stormy weather has carried over into the beginning of March, but one of these days it's gotta stop and get sunny again - right??! We've got some great racing coming up in March over the next few weeks. On Mar. 9-10 Mt Rose will host the McKinney Cup GS races. We'll be racing on Silver Dollar, one of the best GS race hills in Far West. Mt Rose is always a welcoming venue for the masters and a favorite of many. The McKinney Cup perpetual trophy is awarded to the fastest man and women on both days - no age handicapping, so let's get our young racers out there to show us all their fastest stuff! Please note that race day checkin will be at the Mt Rose base area Main Lodge (not the Winters Creek lodge at the Slide Mountain base area where we have held checkin in recent years). Lift access is convenient - just take the Northwest lift from the Rose base lodge to top of Mt Rose and drop onto the top of the Silver Dollar race hill. The early registration deadline is Sunday Mar. 3, with $5/race late entry fee for entries submitted after the deadline, so get your entries in before the price goes up! Online registration closes Thursday Mar. 7 at 8pm. The third week of March is a season highlight: the 2019 Masters National Championships right here in Far West at Mammoth Mountain on Mar. 18-23. The DH national championship is Mon-Tue-Wed, with the SG-GS-SL national championship events on Thu-Fri-Sat. Nationals is open to everyone and is a great way to meet and compete with racers from around the country. Mammoth is a proven venue and will put on a high-quality event, so don't miss this chance to challenge yourself with top-notch racing and make new friends! Registration is open at SkiRaceReg.com/nationals until Friday March 15. The early registration deadline is Sunday Mar. 3, after which there is anadditional $10/race late fee for late entries, so sign up this week! The cancellation deadline is Sunday Mar. 10 to withdraw without any charges. Well, after a rocky start to the season when we had to postpone races due to lack of snow, we are now suffering from an embarrassment of (snow) riches and having to delay/cancel races because of too much snow! It has given us some awesome powder skiing but has also created all sorts of headaches for our racers, race organizers and host areas. However, we have still been able to run many of our scheduled races so far including an awesome speed weekend at Mammoth with perfect ski racing weather. I can honestly say that that was one of the very best weekends of racing I have experienced in 15 years of Masters racing and, judging by all the enthusiasm and smiles at the bottom of the course, most of you were thinking the same! We now have the opportunity to return to Mammoth for more speed races - both DH and SG - as well as GS and slalom at the US Masters Nationals from March 18-23. Now I understand from talking with many of you that some think Masters Nationals is only open to the very best racers. Well, I would like to dispel that myth! While it does attract some of the top Masters racers from around the country it also has racers of all levels of abilities competing. It lets you meet your fellow Master racers from other Divisions as well as experience the atmosphere of a national level event. Having it local to Far West at Mammoth provides a great opportunity to compete without having long distance travel to other parts of the country. For those who do not want to race Downhill I should also point out that the overall rankings and awards at Nationals are based on SG, GS and SL only. There are separate courses for women/older men (>65) and the younger men(<65) in GS and slalom to ensure as far as possible clean course conditions. Given that Far West is hosting the Nationals I would really like to see as many as possible of our racers competing. Registration is open at SkiRaceReg.com/nationals until Friday March 15. The early registration deadline is Sunday Mar. 3, after which there is anadditional $10/race late fee for late entries, so sign up this week! The cancellation deadline is Sunday Mar. 10 to withdraw without any charges. I would encourage you all to sign up and look forward to seeing you there! February turned out to be... interesting! Twenty competitors from Far West took to the road to start the month by joining over 100 other competitors from around the US along with some foreign athletes for the FIS Masters Cup/Western Regional championship races at Aspen Highlands CO. Temperatures were cold, but some excellent performances were posted. A highlight of the event was the celebration with family and competitors of Gate de Mattei's 90th birthday. Incredible milestone for a guy who's still out there skiing hard and looking for sped on the race course! At home in Far West, the month turned into a record-breaker as multiple storm trains rolled through and dropped massive amounts of snow throughout the Sierra. We finally got a weather break the week before our scheduled races at Northstar and Squaw on Feb. 22-24. Faced with fresh snow depths in the double-digit feet and cold dry conditions all week, the race crews at both venues faced a daunting challenge to pack and prepare the race venues, reset safety fences, and generally dig out the race arenas. The decision was made early in the week by the Northstar race organizers and Far West Masters that it would not be possible to safely prepare the race hill by Friday, so the scheduled Friday SG races were cancelled. Even with the extra day, the Northstar crew had an enormous amount of work to do, but by Saturday morning racers were greeted with warming temperatures, partly-sunny skies, and two fun runs of GS. On Sunday competitors moved to nearby Squaw Valley for the Buck Thys Memorial GS on Exhibition, a long and challenging race hill which is one of our best GS venues. The race surface was still relatively soft, compared to the usual "firm" conditions that are often encountered on Exhibition, but good course work by the Squaw crew and good coursesetting on both runs added up to two good runs of GS for a satisfying race day. The competition was enlivened throughout the day as MC John Haines shared stories of Buck Thys and the skiing Thys family. It was a pleasure to be joined by several of Buck and Nina's children, Beatrice and US Ski Team alums Edith and Barry. Edith also foreran both runs on her home hill. Adding to the Squaw heritage, Sunday's race was also scored for the Bernard Cup trophy. The Bernard Cup is a perpetual trophy awarded annually at our Squaw event to the top man and woman racer using an age-handicap formula. Over the years competitors of all ages have won - Buck Thys was the 2002 winner when he was competing in the 70's class. The men's trophy was won handily by Kurt Beldon (M08), who was third overall in the men's results. The women's trophy race was wide open, with competitors of nearly all ages in the running. Overcoming some spectacular skiing from defending champ Andrea Levy (W01), 3rd overall on the day, the women's title went to Carol Levine (W10). Complete results are posted on the farwestmasters.org Race Results page along with the updated Season Standings rankings for 2019. There will be NO racing on Friday Feb. 22 at Northstar. The Northstar race organizers discussed conditions this morning with the race jury and Far West Masters organizers and the consensus is that we will focus on having one good GS race on Saturday. Northstar has received large amounts of snow from the recent storms and the cold weather this week makes it even more challenging to attempt to pack and prepare the race hill, reset fencing, and work towards preparing the venue for racing. So... it'll be an all-GS weekend! Saturday at Northstar, Sunday at Squaw - two good GS hills so we're looking forward to some fun racing. NOTE: online registration for both Northstar and Squaw races will remain open for an additional day until 8pm Thursday 2/21. Just a few reminders about our races coming up next week at Northstar and Squaw. After a pretty amazing run of storms, "Febru-buried" racing in Far West resumes next week with forecasts of clearing weather. We have a Fri-Sat stop at Northstar for two SG races on Friday and a GS on Saturday, followed by a GS on Sunday at Squaw Valley. The Squaw GS will be the 2019 Bernard Cup trophy race, using an age-handicap formula for awarding the overall men's and lady's titles, so racers of all ages have a shot! Please note that the Thursday afternoon SG training session at Northstar has been cancelled - we did not have enough signups. The early registration deadline is Sunday Feb. 17, with $5/race late entry fee for entries submitted after the deadline, so get your entries in before the price goes up! Online registration for the Northstar and Squaw races closes Wednesday Feb. 20 at 8pm. Area release form is REQUIRED at both Northstar and Squaw. Competitors who have not signed the release will NOT be permitted to compete. Northstar has requested that competitors send signed release form ahead of time to NorthstarRaceDept@vailresorts.com in order to make checkin simpler and faster for all. Squaw release forms will be available at checkin. Our Far West race schedule takes a break in early February for the FIS Masters/Western Championship races at Aspen CO on Feb. 8-10, with three days of racing SL-GS-SGx2. Both SG's and the DH race immediately following on Mon-Tue Feb. 11-12 are part of the 2019 masters National Speed Series. Our next Far West races will be a joint north-shore Tahoe event, with two SG races and a GS at Northstar on Fri-Sat Feb. 22-23, following by a GS race at Squaw on Sunday Feb. 24. Northstar is also offering SG training on Thursday afternoon 1-3pm, so plenty of racing on tap! Please note that signed Northstar Release of Liability is mandatory for all competitors in order to participate in training and races. Northstar has requested that competitors send signed release form ahead of time to NorthstarRaceDept@vailresorts.com in order to make checkin simpler and faster for all. The Sunday Squaw GS will be the 2019 Bernard Cup race. Unfortunately, we were unable to find a suitable date to reschedule the cancelled January Sqauw SL/GS races that were originally planned as the Bernard Cup races. Race photos of the Saturday SG races at Mammoth on Jan. 26 were taken by veteran race photographer Sue Morning and are available online for viewing and purchase. All photo purchases support the Mammoth Mountain Community Foundation (MMCF) and kids in the Eastern Sierra, including the Mammoth team athletes like our forerunners at the speed event. Photos can be purchased from the Susan Morning Photography online site in a variety of print formats or as a downloadable digital image. Sue got some great shots so well worth browsing the gallery to see yourself and your racing friends! Wow. Just... WOW!!! What an amazing, spectacular, incredible event we had with four days of DH and SG speed racing at Mammoth Mountain on Jan. 24.27. It really doesn't get any better than this - comfortable, sunny weather, fantastic conditions on the speed track, top-notch support from the Mammoth Mountain Race Department throughout. Talk about smiles all around - yeah!! Despite some worries about whether the 5-6 ft of new snow from the preceding weekend would pack in enough, Thursday's DH training day opened with a sunny day on the World Cup/Fascination course. With many competitors coming in without any speed practice this season, most took the first training run to get used to the hill and the speed. Giggles and smiles spread at the finish as competitors realized how great the track ran, and enthusiastically cycled around to open it up on the second training run. The good times kept rolling with two DH races on Friday, with the first race counting in the 2019 masters National Speed Series as well as our Far West season scoring. It was great to be joined by competitors from Rocky and Intermountain travelling the speed series tour. Despite pleas for another day of DH racing, on Saturday we switched to two SG races on the World Cup/Terries course. Again, the first race of the morning counted for the Speed Series. Ho hum, another perfect day in masters racing paradise - spectacular conditions, beautiful weather, great snow conditions on the course. Pretty incredible! Complete results are posted on the farwestmasters.org Race Results page along with the updated Season Standings rankings for 2019. Speed series results are published on the NSS page on usalpinemasters.org. The Sierra is emerging from a snowy week that brought multiple feet of snow, just in time to shift to a dryer pattern for the annual Mammoth DH/SG speed event! Although there is a lot of new snow, the Mammoth Race Department and grooming crews have a proven record of excellent course preparation and they know their speed track, so we are optimistic that this could turn out to be a spectacular event. Thursday and Friday are DH training and two DH races. Thursday DH training is mandatory - all competitors must participate in at least one training run to be eligible to race on Friday. Note that there is an additional $40 fee for the training day, in addition to race entries for Friday's two DH races. On the weekend we shift to SG, with two races on Saturday and one on Sunday. So that's a lot of fun packed into a few days. If you like to challenge yourself, this is it! As an additional incentive, the first DH race on Friday and the first SG on Saturday count for the 2019 National Speed Series. The races are also a preview of the national championship venues, with the 2019 Masters National Championships to be held at Mammoth on Mar. 18-23. Reminder: the early registration deadline is Sunday 1/20, so get your race signups in skiracereg.com/fw. Registration closes 8pm Tuesday 1/22; late entries and cancellations after the close of online registration are at the discretion of Mammoth Race Dept. The planned Squaw Valley Bernard Cup SL/GS races on Jan. 12-13 had a complicated evolution in the week leading up to the event, switching from concerns of insufficient coverage on the Exhibition race run to concerns after weekend storms followed by midweek rain to whether the hill could safely be prepared for racing. The final decision was made on Thursday afternoon by Squaw that the races could not be held due to last-minute staffing issues. The late-breaking race cancellation is extremely unfortunate and is sincerely regretted by the Far West Masters board and race organizing team. We are deeply aware of the commitment that our competitors make to plan their race participation, including travel time and reservations that many of us have to make to attend a race event. On a positive note, we appreciate that Mark Mirviss and the Squaw masters coaches provided competitors already committed to coming to Squaw with a weekend alternative of free SL and GS training both days. Multiple reports have been received from participants that the training sessions were very good. Discussions are in progress between Far West Masters and Squaw to assess the options for rescheduling the Bernard Cup and we'll announce a new schedule as soon as a satisfactory plan can be made. Our January racing program in Far West started off with the classic Viva Italia Cup SL races at Heavenly Valley on Friday Jan. 11. The World Cup race run at the Heavenly California base has been a reliable and popular venue for many seasons. Although the hill is relatively short, snow conditions are often firm and the challenges of SL are supplemented by a warmup hike from the top of the lift up a short but steep pitch to the starting gate. Heavenly welcomed us with clear weather and an enthusiastic course crew that kept the race day moving expeditiously through 4 runs of SL. The field of over 50 competitors featured an exceptionally young and strong women's field, with multiple women breaking into the overall top 10 in both races led by Casey Edgeton's smoking Buck Hill-honed charge keeping men's overall winner Ryan Ritchie working to hold his lead. The day ended with a pizza party at the base of the race hill while the age handicap scoring was computed to determine the overall Viva Italia Cup winners. The trophy award went to two class 8 competitors who combined consistent fast skiing with sufficent age to edge ahead of the younger athletes in the final rankings. Former winner Deb Lewis took the ladies title, while hard-working TD Doug Fulton abandoned his "slalom boy" moniker to convincingly ascend to the Slalom King seat. Complete results are posted on the Race Results page along with the updated Season Standings rankings for 2019. We are very disappointed but unfortunately the Squaw races for Sat-Sun Jan. 12-13 must be cancelled due to last-minute staffing issues. For all who have made plans and travel reservations already, Squaw is offering free race training to everyone on both Saturday and Sunday on Exhibition, as well as a free lift ticket on Saturday for anyone who needs lift access. Meet at the base of Exhibition at 9:30am for training. If there is sufficient interest, Mark Mirviss says he can set up Brower timing as well. Once again, we very much regret this schedule change and the disruption to all who made plans and have been looking forward to this event. Our next races after the holiday break are coming up in just over a week at Heavenly on Friday Jan. 11 for the Viva Italia Cup SL races and on Sat-Sun Jan. 12-13 at Squaw Valley for the Bernard Cup SL/GS races. Both of these events include an overall trophy for the fastest man and women, using an age-handicap formula that allows racers of all ages a shot at these perpetual trophies. We will be racing on the World Cup run at Heavenly, at the base of the California base. World Cup is a good SL hill that has been a popular venue for many years and Heavenly is always a gracious host to the masters. The race hill is reported to be in excellent condition with copious snowmaking thanks to the recent cold weather. For the weekend, we shift to the north shore of Tahoe to Squaw Valley, racing SL on Saturday and GS on Sunday. Early season coverage on the lower mountain at Squaw has been thin, but we are expecting a good storm series over the coming weekend that should bring a good increase to the snowpack. The masters have been in close contact with the Squaw Race Department to monitor conditions and will continue to do so over the next few days. Online registration is open on SkiRaceRegReg. Remember that the early registration deadline is Sunday evening 1/6; prices go up next week so get your entries in now! You have until the close of registration at 8pm Wednesday 1/9 to withdraw, so there's no penalty to signing up early. And while you're on SkiRaceReg, remember to sign up for the National Championships at Mammoth in March!! Happy New Year! While everyone is hopefully enjoying holiday time with family and friends, it's a good time to plan ahead for the racing schedule in the coming months. This season we have two major masters events located in the Western region. On Feb. 8-10 the international FIS Masters Cup series makes its North American stop at Aspen with SL, GS, and two SG races. This event is also the Western Region Championships. And to make the travel worthwhile, Rocky Masters are hosting two DH races immediately following the FIS masters races on Mon-Tue Feb. 11-12. The "big one" for all of us in Far West is the Masters National Championships, returning to Far West's own Mammoth Mountain on March 17-23. This is a 4-event nationals, with the national championship DH on Mon-Tue-Wed followed by SG-GS-SL national championships on Thu-Fri-Sat. The Aspen SG's and DH and the Nationals DH and SG are all included in the 2019 Masters National Speed Series. Far West competitors can collect speed series results and get a preview of the nationals speed venues at our Mammoth speed weekend coming up on Jan. 24-27 with two DH races and 3 SG, with the first DH and SG races counted in the Speed Series standings. The 2018-2019 Far West Masters race season kicked off the weekend before the Christmas holidays with three days of excellent racing conditions at Mammoth Mountain. The weather was a bit of a mixed bag - clouds and wind with a couple inches of new snow for Friday's first GS, warm and sunny for the Saturday SL's, and back to breezy and overcast for Sunday's final GS race. But despite the varying weather, the race surface on Andy's Double Gold (ADG) was consistently outstanding - firm and grippy. Mammoth Race Department put on a first-class event for us, with a large race crew every day and beautifully prepared courses. The pre-holiday timing was a bit difficult for some to negotiate, but those who were able to make it were treated to an excellent kickoff to the race season. Many thanks to the Mammoth Race Department for hosting an excellent season opening event for us, and congratulations to everyone who competed!! Complete results are posted on the Race Results page along with the first Season Standings rankings for 2019. What a difference a few weeks can make! Going into Thanksgiving everywhere was brown in the Sierra, with limited man-made snow at those areas able to open. But December rolled in with a lovely series of storms that transformed conditions and set up all our Sierra resorts with great conditions going into the upcoming holidays. Our first Far West Masters races of the 2018-2019 season will be held next week at Mammoth, with the postponed Dec. 1-2 races added onto the originally scheduled Fri-Sat races. We will now be racing GS on Friday 12/21 (as originally scheduled), two SL races on Saturday 12/22, and an additional GS race on Sunday (postponed race makeup). Mammoth Race Department will be providing a two-day training camp on Wed and Thu Dec 19-20, so come early if you can and get in a couple solid days of training before the races. Mammoth Mountain is now in full operation and the conditions are very good. Weather outlook for next week is also encouraging - after a moderate storm on Sunday/Monday, forecasts call for clearing and warm through the rest of the week, so we should have very good conditions to kick off the race season!! We realize the timing of the opening event will conflict with holiday plans for some, but after our delayed start of the season we wanted to take advantage of Mammoth's offer to host the additional races so that we have racing to offer those who can attend. If you can't make it, happy holidays to all and we look forward to gathering in early January at Heavenly and Squaw for our next event. Reminder: the early registration deadline is Sunday 12/16, so get your race signups in skiracereg.com/fw. Registration closes 8pm Wednesday 12/19; late entries and cancellations after the close of online registration are at the discretion of Mammoth Race Dept. Due to limited terrain and coverage available for racing and training, the decision has been made to postpone the Mammoth masters training camp on Nov. 26-30 and the opening GS/SL races on Dec. 1-2 and reschedule as part of the late December event at Mammoth. Although forecasts for the Thanksgiving holidays predict moderate snowfall for the Sierra, dry weather returns the following week and it is unlikely that even with good snowmaking conditions that adequate race conditions could be prepared. The rescheduled event will now be 3 days Fri-Sat-Sun Dec. 21-23: GS Fri, SLx2 Sat, GS Sunday. A shortened training camp will be held on Wed-Thu Dec. 19-20 with SL and GS training. Online Membership Renewal: online membership renewal is available through our Far West Masters race series on SkiRaceReg.com. The online membership options allow you to pay your membership dues using the same online account that you use to sign up for races and pay race entry fees. You will also have the option to purchase a print subscription to the Forerunner newsletter if you wish to receive a copy in the mail in addition to the electronic copy distributed to all members. Joining online is quick and easy, highly recommended!! Note: the first time you sign into your SkiRaceReg.com account at the start of the season, you will be told that your account is "inactive" and needs to be reactivated for the new season. You didn't do anything wrong, this happens every year!! We need to make sure that the contact and payment information for your account is up-to-date, so just follow the instructions on each page, it should only take a few minutes. We've put together a "FAQ" (Frequently Asked Questions) on about your SkiRaceReg.com account and the signup/renewal process, so take a look at that if you're not sure what's going on, or contact the Far West series administrators at raceadmin@farwestmasters.org if you need assistance. The Fall issue of the Forerunner newsletter is out! Click the link below to read online or download your copy. The Fall newsletter as well as previous issues of the Forerunner from past seasons are always available on the Newsletters page. Electronic copies of the Forerunner are sent out on the news email list to all recent members of Far West Masters. If you purchased a print subscription to the newsletter last season, you will also receive a copy in the mail. The Fall issue is packed with news about the upcoming season, including the complete season schedule and the Far West Masters membership package containing information on the 2018-2019 program and membership options for new and renewing members. Please get your Far West Masters membership in to Membership director Mary Feddis by Nov. 16 so she has time to process everyone's application and ensure that our membership records and bib assignments are up-to-date for the coming season. Membership renewals received after the deadline are subject to a $5 late fee. REMINDER: don't forget to renew your U.S. Ski & Snowboard masters membership! Early renewal deadline is Oct. 15 and a $25 late fee will be charged for late membership renewals. Online Membership Renewal: We're very pleased to be able to offer online membership renewal again this season through our Far West Masters race series on SkiRaceReg.com. The online membership options allow you to pay your membership dues using the same online account that you use to sign up for races and pay race entry fees. You will also have the option to purchase a print subscription to the Forerunner newsletter if you wish to receive a copy in the mail in addition to the electronic copy distributed to all members. Joining online is quick and easy, highly recommended!! Coming Soon: Membership renewal on SkiRaceReg.com will be opened next week; webmaster and race series administrator Deb Lewis will be working over the weekend to install all the 2019 season information so we can open for membership renewal as soon as possible. We're a little late getting the 2019 updates posted, please be patient - we're doing a major internal renovation of the web site to enable improved capabilities and a modernized design for the coming season. The preliminary 2018-2019 race schedule is now available. Scheduling Director Mike Braun has worked hard to put together a race schedule which offers diverse competition opportunities at areas in Far West with a proven ability to host excellent events. Although there are still a few details being settled, we believe the preliminary schedule is essentially complete and should provide a fun season of racing opportunities. A highlight of the season will be the Masters National Championships at Far West's own Mammoth Mountain on March 18-23. This is a 4-event nationals, with the DH championship along with the triple-combined SG/GS/SL championships. The end-of-season May issue of the Forerunner newsletter is out with season wrapup and spring news stories to jog your skiing memories as everyone shifts into summer activities. 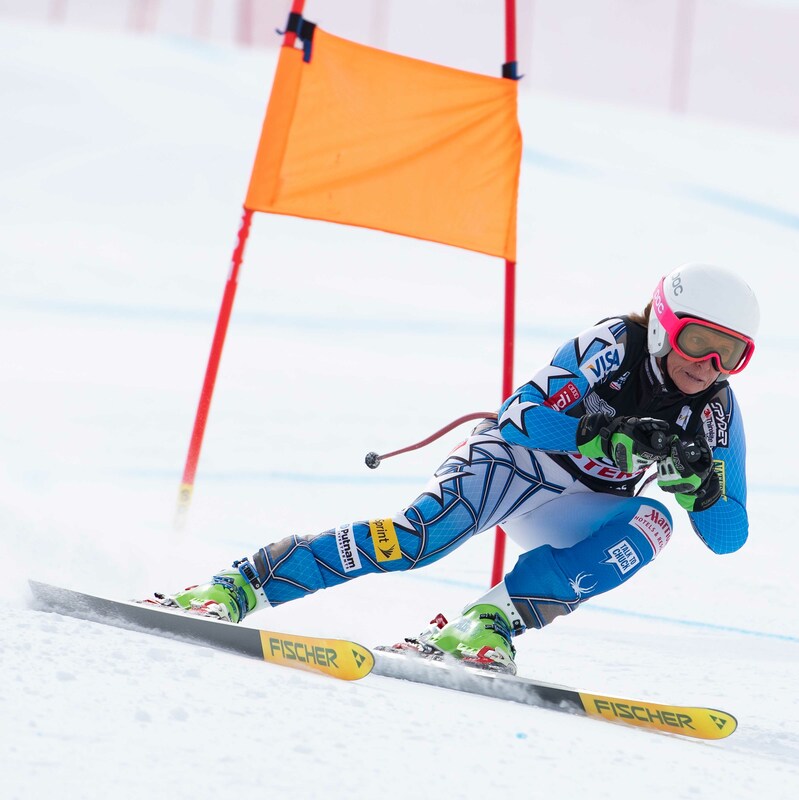 Newsletter editor Hamish Butler has pulled together stories from the final events of our season, along with reports from the March FIS Masters World Criterium at Big Sky MT and news about some of our scholarship athletes. Click the link below to read online or download your copy. The March newsletter as well as previous issues of the Forerunner from past seasons are always available on the Newsletters page.